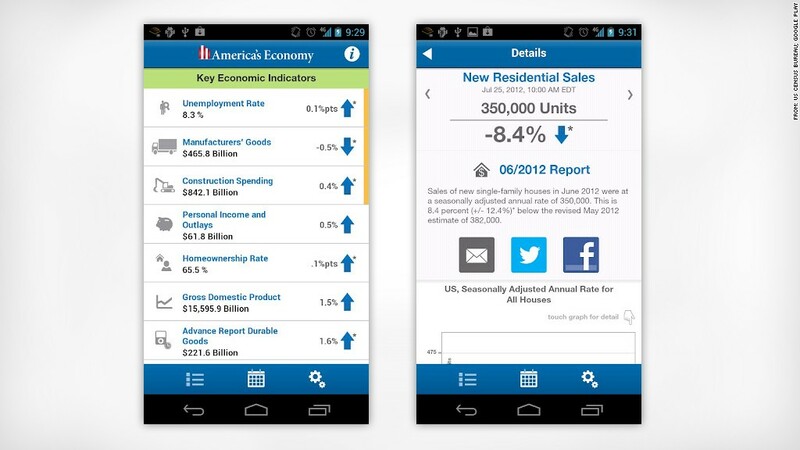 A new Census Bureau app gives users real-time access to key economic data. Ever find yourself away from your computer but really wanting to know about the United States' durable goods trends? Believe it or not, there's now an app for that. The U.S. Census Bureau is making it easier for anyone with a smartphone or tablet to access the latest statistics on the nation's economy through a new app called "America's Economy." Combining data from the Census Bureau, The Bureau of Economic Analysis, and the Bureau of Labor Statistics, the app provides constantly updated information on important economic indicators and trends. The new app allows users to track monthly and quarterly trends in 16 key economic indicators including employment, personal income, housing construction, international trade, manufacturing, and retail sales. Users are also able to set alerts for statistic updates and add new data release schedules to their personal calendars. "The release of this app is an example of our commitment to giving taxpayers faster and easier access to the statistics we produce, including the Economic Census, that impact the lives of all Americans," said Census Bureau Director Robert Groves. The Census Bureau launched the America's Economy app Thursday exclusively on the Google (GOOG) Play app store for Android devices, but the agency says the app should be available inApple's (AAPL) iTunes App Store for iPhone and iPad users "in the coming weeks." America's Economy is the first of three mobile applications the Census Bureau says it plans to launch over the next several months. In July, the Census Bureau launched a public tool for software developers interested in designing new ways to get government statistics to the public through new apps. The goal: get the troves of government data easily into the hands of those that want them. "We are looking to create a contest or a hack-a-thon to bring users and developers together in one room to design apps we have not even thought of," said William Bostic, the Census Bureau's associate director for economic programs, on the agency's blog.